The Department of Teacher Education has a legacy of excellent teaching, meaningful service and creative research. In addition, the department makes a significant contribution to the university's mission: To continue to provide the initial and continuing professional education of those who teach and serve as administrators and counselors in K-12 schools, as well as in institutions of higher education. The School of Education has been continuously accredited since 1954 by the National Council for the Accreditation of Teacher Education (NCATE) and the Mississippi Department of Education. Successful not only in preparing exemplary teachers but also in focusing on the continuing professional growth of teachers, the Department of Teacher Education partners with the North Mississippi Education Consortium (NMEC) and the World Class Teacher Program (WCTP). The NMEC provided professional development for 4,925 teachers, counselors and administrators in 2006. Since its inception in 2003, the WCTP has provided professional development and mentoring that assisted 441 teachers in receiving national board certification. 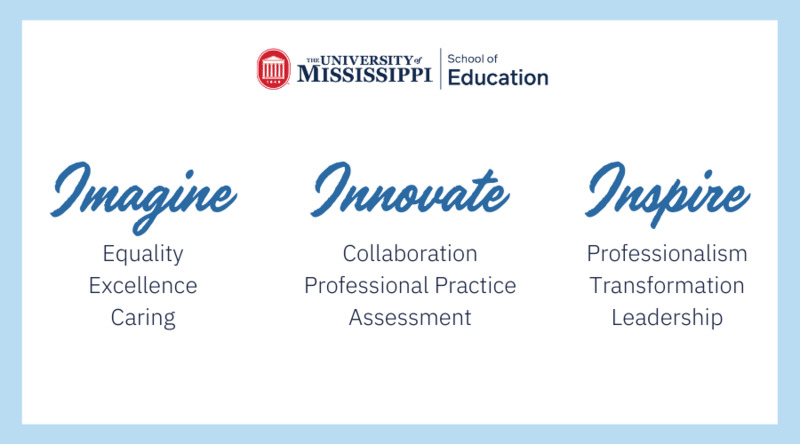 At The University of Mississippi School of Education, undergraduate and graduate programs prepare candidates to be an inspiration to students, effective professional educators and advocates for diverse learners. Nationally and internationally renowned faculty who are successful authors and researchers serve as mentors throughout the candidate's teacher-preparation program.